Local Mirror: ICS Form 205, Region 3 Connecticut ARES (Last Updated 4/11/2011). For those who are not familiar with the ICS (Incident Command System) nomenclature, the Form 205 is a “Radio Communications Plan” that lists all the information you need to program your radios, plan for deployments or events, etc. It allows you to quickly communicate to other emergency (or volunteer) personnel what sort of equipment and setup will be needed to communicate effectively via radio. A project of the command team for Connecticut Region 3 ARES has been the creation of a radio communications plan in the ICS-205 format showing all local simplex and repeater assignments for emergency use. Thanks to Richard, KB1ONM and everyone who offered support with updates and such – the project is complete. Please use the ICS-205 forms when programming EOC radios. This will make it considerably easier when we need to send volunteers not familiar with your EOC. The new ICS form is on the Forms/ICS Docs link on the left. The form 205 can be downloaded from the CT Region 3 Website. Other approved CT ARES ICS Forms such as ICS-213 are also available for download. Form 205? 213? ICS? NIMS? The form 205 is part of the Incident Command System that ARES follows when working with served agencies. The form 213 is a message form similar to the ARRL radiogram, but that conforms to the standards used by other non-ham agencies. ICS is not the same as NIMS (the National Incident Management System). NIMS is a larger overall framework and set of standards for managing emergency situations that cross jurisdictional levels – ICS is one of the standards that NIMS relies upon. The ICS is used as a standard by many NGOs, police agencies, and international organizations. The ICS provides for various positions that should be filled as part of incident command teams for different levels (ICS-100, 200, etc). 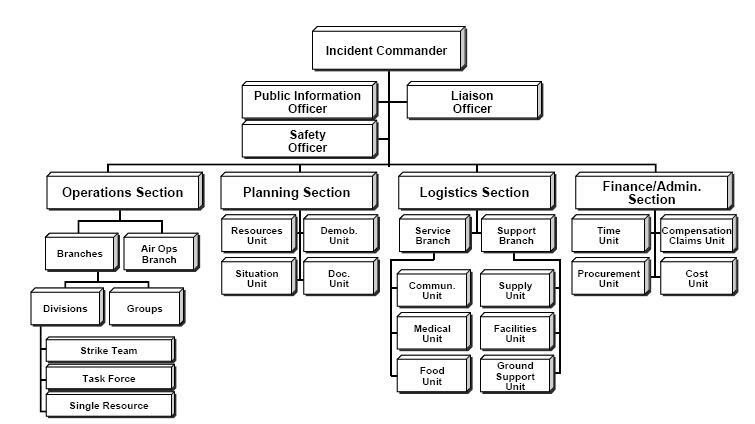 The ICS 100 level, for instance, includes public information, safety, operational, planning, logistics, and financial sections with various support staff for each (see the chart above). Amateur Radio will usually come under logistics, but may also be assisting with operations. It is highly recommended you take the ICS-100 class for free from FEMA (click on Interactive Web-Based Course) and the Emergency Communications courses from ARRL. Without these courses, it may be very difficult during an emergency, and far too late, to start explaining where individual ham operators “fit” and how message traffic should be directed. Other courses of interest can be found on FEMA’s website.